A few years ago, before the first Transformers movie came out at the cinema, I was with my youngest son in Toys R Us in Cardiff and wanted to buy some of the great new Transformers toys that were in stock. When you walked into the shop, the new one in Cardiff Bay, there was a feature wall on the right hand side of the shop with the latest toys displayed on it. Now, they also had a great offer on – 3 for the price of 2 on ALL Transformers toys. Great stuff. I picked up a movie Optimus Prime, an Optimus mask and a Transformers Scalextric. However, when I got to the till they didn’t go through as 3 for the price of 2, they were all full price. I naturally queried this, and the manager came out to see what was up. 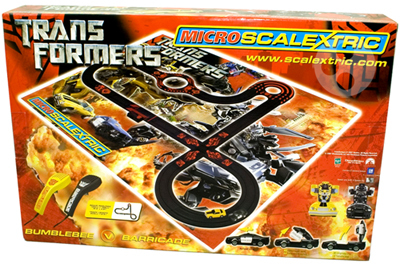 I was then informed that the Transformers Scalextric wasn’t included in the offer – yet it was on the feature wall with the rest of the Transformers toys. The manager questioned that, saying I must have picked it up in the Scalextric aisle, rather than from the Transformers feature wall. He was wrong, which he quickly spotted when he went to the feature wall. However, he returned with what can only be described as the smirk of someone who thinks they’ve found the proof they need to get them out of trouble. The smarmy git brought back the sign that read: All Hasbro Transformers 3 for the price of 2. He maintained that the Transformers Scalextric was manufactured by Hornby, so wasn’t Hasbro, thus wasn’t in the offer. Having little time with my son I didn’t stay to argue the toss (unusual I know) and I left, not buying the items. So this unhelpful moron ducked the offer by insisting that Hornby’s Transformers Scalextric wasn’t Hasbro, so wasn’t included in their carefully worded offer, yet how could it have been made if it weren’t licensed by Hasbro? This back of box shot clearly shows the Hasbro logo (on the right, above the pictures of Bumblebee and Barricade), as all Transformers products (without exception) are licensed by Hasbro – therefore, it is a Hasbro Transformers product. How do people like that get jobs where they deal with the public? I’m looking forward to the TRU Masterpiece Grimlock next year though. Old news Mr Daz, old news! What’s going on with you? Have you moved to Stepford? You need to restore your edge! You’ve really been scraping the barrel bottom of late, Mr Daz.. A few years ago we had the wonderfully entertaining stories about your battles with the CSA, your house, insurance fraud and your ex-wife. All we get these days are wearisome tales about wine bottle vouchers and ear sweat – and now this nonsense? Do any of the stories you’ve posted over the last year or so really qualify as “the worst luck in the world”? Nice story, shame abuot the outcome. One point, don’t see much of a deal, “2 for the price of 3” have a think about it for a moment…….wait for it……..doh! Good point Alex, amended that one.